Providing care for a loved one facing a chronic or life-limiting illness or disease can prove stressful and exhausting, especially as the dying process begins, but also the ultimate act of love. 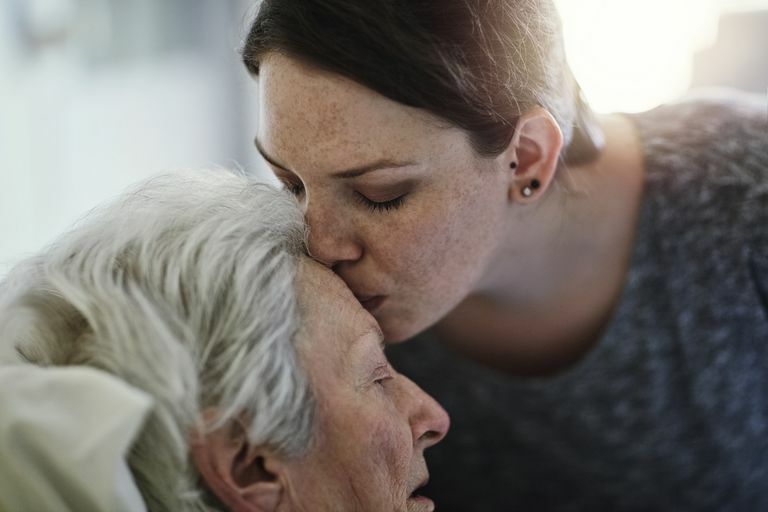 If you wonder whether you're doing, saying or even thinking the right thing, this article's practical suggestions can help you better care for a dying loved one at home. As the patient begins the journey toward death, he or she will grow weaker and become increasingly sleepy. This becomes more pronounced as the dying process continues, and caregiving can often become more difficult and the work more intensive. As a caregiver, you must focus on two things as your loved one grows weaker: safety and skin care. Improving home safety often begins by rearranging your furniture and other objects to allow your loved one to move about more easily. This is also the time when you should consider obtaining durable medical equipment, such as a hospital bed, walker, wheelchair, or bedside commode if you haven't done so already. Having the proper medical equipment, and enough space to use them properly can help prevent falls and other accidents. Skin care is also vitally important during this time. As your patient increasingly spends time in bed or sitting in a chair, he or she faces a greater risk of developing pressure sores on his or her body. Also known as decubitus ulcers or bedsores, pressure sores result from decreased blood flow to an area of the body due to continual pressure on the skin. Friction on the skin from repositioning the patient, sliding them down in the bed and/or a lack of adequate nutrition can also compound the problem. Thus, it's important to change your loved one's position in the bed every two hours while you're awake if he or she cannot do so alone. Alternate between laying them on their back and turning them on their right and left sides. Keep a lot of pillows handy because you should place one beneath your loved ones' back, another between their knees, and perhaps one under their arm when they lay on their side. Check their skin often – especially at the base of the spine (the tailbone), heels, elbows, and hips – and look for any areas of pinkness or redness. Gently massage discolored areas with lotion to stimulate blood flow. You can also elevate their heels by placing a pillow under his or her ankles so the feet hang off the edge. You can relieve pressure on the elbows in much the same way, i.e., place pillows under the upper or lower arm. Make sure the patient's elbows do not touch the pillows or the bed. If your loved one already has a pressure sore or develops one while you are caring for them, don't punish yourself. Even with meticulous care, patients can still develop them. Be sure to alert your healthcare provider about the wound so they can develop a plan to care for it properly. They might also recommend an air mattress to provide additional cushioning and to help relieve pressure. You should also take care to keep your loved one's skin clean and dry. If they are wearing adult diapers, check the diaper at least every two hours while you're awake and change it if it becomes soiled. A patient's already dwindling appetite might disappear entirely as he or she approaches the end of life. While your loved one might tolerate small bites of soft food or sips of a liquid, the time might arrive when he or she refuses to eat or drink at all. This is usually very difficult for the dying person's loved ones to see because we often equate food with health and feeding people as an act of love. Watching your loved one refuse food and fluids can make their impending death a reality, and the inability to show your love via food might leave you feeling helpless. Rest assured that the lack of eating and drinking probably causes you more distress than it does your dying loved one. Hunger and thirst are rarely a problem at the end of life, so you should continue to offer a variety of soft foods as long as your loved one is conscious (but allow them to refuse it). Also, continue to offer sips of water or other drinks of choice as long as he or she is conscious. While patients rarely complain of thirst at the end of life, a dry mouth can be a problem. Lubricate your loved one's lips with a small amount of petroleum jelly or lip balm to prevent cracking. You can also moisten their mouth with a few drops of water from a straw or a moistened toothpaste swab (a small sponge on the end of a stick) whether he or she is awake or has lost consciousness. Terminal restlessness is a form of delirium often seen in dying patients. Some studies suggest that nearly 80 percent of dying individuals will experience anxiety or restlessness to varying degrees. Signs that your loved one is restless might include an inability to relax, picking at their clothing or bed sheets, confusion, and agitation, or trying to climb out of bed. Some causes of terminal restlessness are reversible, such as pain, a full bladder, constipation, or the side effects caused by medication. If the cause cannot be identified or the symptoms persist after treatment, your loved one might benefit from an anxiolytic, such as lorazepam. It's also important to notify your healthcare provider as soon as the symptoms of terminal restlessness start. Identifying the cause of terminal restlessness and treating it early can provide a significant impact on your loved one's final moments, as well as your experience while caring for them. It's normal for your loved one to experience significant temperature changes near the end of life as his or her body loses its ability to self-regulate. If you notice that your loved one has a fever and sweats profusely, or feels cool to your touch and shivers, there are some easy steps you can take for either problem. If your loved one has a fever but can still swallow pills, you might give him or her acetaminophen (Tylenol) tablets. If the patient is unconscious, try using an acetaminophen suppository. Acetaminophen is an effective antipyretic (fever reducer), as well as a pain reliever. If your loved one has a fever and you are providing care at home with the assistance of hospice care/services, you might have already discussed a plan of action if a fever develops. Many hospices use a prepackaged kit of medications to treat end-of-life symptoms (sometimes called an emergency kit or a hospice comfort kit) and instruct caregivers on their proper use. Most of these kits include acetaminophen in some form. Another thing you can do to reduce a fever is to use compresses by applying a cool, damp washcloth to the patient's forehead, neck and/or armpits. You should never place ice or an ice pack directly onto bare skin, however, so wrap ice or ice packs in towels before applying them. Make sure you check the area under the cool compress often and remove it after 15 minutes. If the patient has a fever, you can also dress them in a cotton T-shirt or nightgown, or a hospital gown if one is available to you. If you feel like you need to cover them, use just a sheet. In addition, if your loved one sweats a lot, check the bedding often and change it if necessary. If your loved one is shivering, adding a blanket or two should be enough to improve his or her comfort. You might also add a pair of soft, comfortable socks. Finally, if you notice that your loved one's toes, fingers, nose and/or lips appear gray or blue, understand that this is normal as the body's blood circulation slows down. Changes in circulation are often most noticeable on the feet and once they become mottled and blue or purple, the time of death is generally drawing near. You might notice these signs occur with certain movements or activities as you're providing care, or they might happen spontaneously. If your loved one has been on a regular schedule of pain medication, it's important to maintain it even if he or she loses consciousness. Your healthcare provider should have developed a pain-medication plan for you if your loved one becomes unresponsive. If your loved one has not been taking pain medication regularly, it's still important to monitor him or her for signs of discomfort and to have medications on hand in case of pain suddenly develops. Morphine is often included in hospice comfort kits, along with the acetaminophen suppositories mentioned above. Dyspnea, or shortness of breath, is often a distressing symptom not only for the dying person but also for his or her family members and friends. If your loved one is breathing rapidly (more than 24 breaths per minute) and appears uncomfortable, morphine might prove the treatment of choice. Morphine not only offers effective pain-relieving properties but also does an excellent job of treating dyspnea. It slows breathing down, which allows the patient's body to take more-effective breaths while reducing the sensation of breathlessness in the brain. If your loved one is allergic or intolerant to morphine, other opioid medications might help manage dyspnea. Another common and unsettling occurrence near the end of life is known as the "death rattle." This is essentially a loud, wet-sounding form of breathing that happens when saliva and other secretions build up in the patient's throat and airway passages. When healthy, most of us can cough, clear our throats, or swallow or spit out these normal secretions, but a dying person loses the ability to effectively clear them. While the resulting sound often proves more distressing to loved ones than the dying person, medications that dry up excess secretions are usually effective in treating the loud breathing associated with the death rattle. Finally, as the end of life approaches, you might notice that your loved one breathes irregularly, which is referred to as Cheyne-Stokes respiration. If this occurs, your loved one might breathe very fast at some moments, quite slowly the next, or even temporarily stop breathing (known as apnea). Cheyne-Stokes breathing might not need any treatment but if your loved one seems short of breath, treatment methods for dyspnea (above) might prove helpful. When a patient's death is imminent, his or her breathing usually slows (or continues with Cheyne-Stokes respirations) until it finally ceases altogether. Death occurs when breathing has stopped and the patient's heart stops beating. Unless you previously arranged your loved one's end-of-life services, then you will also need to plan a funeral, memorial and/or interment services in the coming days. Most importantly, you need to take care of yourself in the hours, days and weeks ahead. As a caregiver for your loved one, you have probably experienced caregiver stress to some degree, which can compound the grief you will naturally feel at this difficult time. Why Is My Dying Loved One Angry at Me?